Paired with complementary Harlequin diamonds, the gold fleur de lis at the center of this popular check design is a real gem! With its classic styling and heraldic motif, this style is perfect for traditionalists like you! But better still, our Gold Fleur de Lis Checks are now available in a convenient side-tear format, so you can say good-bye to accidental rips. That's because the perforation on the short side makes for better leverage and a trouble-free tear. 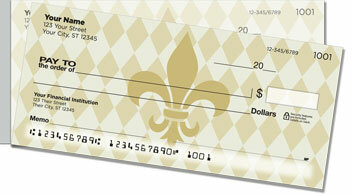 Hurry -- personalize a set of our Gold Fleur de Lis Side Tear Checks today!